The Volkovtsi Cossacks are a professional dance ensemble performing traditional Cossack dancing that originated in Russia and Ukraine. It draws its members from old and new émigrés and other professional dancers with a natural aptitude for this specialised form of dance. The group performs Cossack dances from varied regions as well as traditional folk dances from Russia, Ukraine and the Caucasus. Some of the dances display very similar steps but have regional inflections on movements. Also, the group has retained the old style of Cossack dancing which was only kept by the émigré communities and lost in their originating countries. Performances have taken the ensemble worldwide from Europe to the U.S.A and Canada, and also to the Far East. 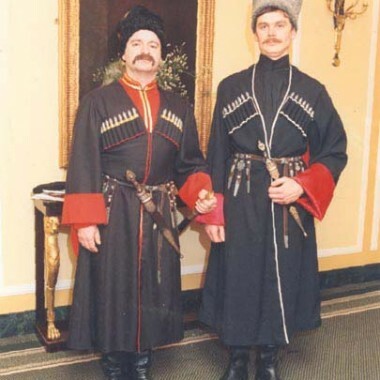 Ranging from small cabaret functions to full concerts the Volkovtsi Cossacks have entertained a wide range of people including royalty, also regularly appearing on television. If required, professional musicians and singers also appear with the dancers, playing traditional instruments and performing music and song to accompany the dancing. Likewise, the Volkovtsi Cossacks perform for others under different names to suit the contract, which is why you may recognise the faces but not the name! With the Volkovtsi Cossacks you can be guaranteed an entertaining time with colourful costumes, sword fighting, the sensational “Fight of the Dwarfs”, humour and the exuberance expected from this type of dance that will have any audience clamouring for more. 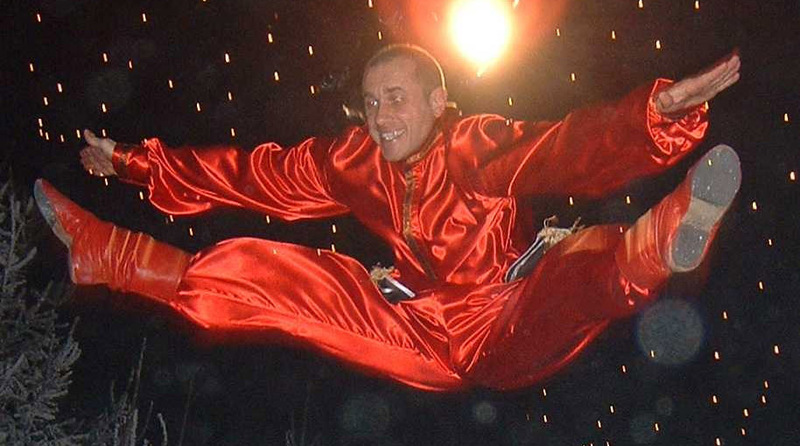 An evening of Cossack entertainment brought song, dance, music, acrobatic clowning and pantomime: bright and colourful costumes and performances to match. The diverse and interesting programme opened with a lively dance performed by the whole company (five men and four women). A romantic duet – Rozazhck – followed and was danced with tenderness, affection and humour, qualities which characterised the choreography of Mikhail Berkut. Interspersed with instrumental, traditional melodies and song was a jovial interpretation of Cossacks fighting, choreographed by Andrei Simonov. Culminating in the Zaporozhian Suite and Sword Dance, also choreographed by Simonov, the first half was brought to a close with a medley of gypsy dances. The lovely backbends, beautiful feats and gentle dancing of the girls contrasted strongly with the high leaps and characteristically masculine dancing of the men. It had many excellent moments. A very pretty Spring Dance showed off the girls as neat, dainty dancers with lovely feet and arms. Two pantomime pieces of comedy and pathos demonstrated the company’s ability to act as well as dance. The romantic solo, Handzye, again choreographed by Berkut, described in the programme as “the plight of a young girl and a broken rendezvous” was so beautifully performed that, for me, it was the high point of the evening. Predictably, the finale was full of Cossack “party tricks” – turns, back flips, hand walking etc etc, and it brought the evening to a rousing finish, audience clapping and cheering all the way. A riot of colour, a display of exuberant dancing, some comedy interludes and unceasing folk and gypsy music from an ensemble of accordions, guitar, tambourines and above all violin, made this an exciting concert. The costumes made from different materials and in different styles, especially the colourful scarves of the girls when used expressively and seductively, played an important part in the dances. The very name, Cossack, conjures up an image of a fearsome, indomitable fighter and implacable enemy, and this fighting spirit was obvious in the vehemence of their sword-play, when sparks literally flew from the blades. Nevertheless a romantic side featured in a dance duet, with hints of coy seductiveness from the girl, and impatience and despair from the man, before he eventually won her. Two demure maidens watched with interest as three doddery old men tried, without success, to perform the dances of their youth, one having to have extreme physiotherapy on a wayward knee – clever miming which appealed to many. However, the antics of two dwarfs having a violent wrestling match brought much laughter and great applause, as part of the costume was removed to reveal just one performer. Later the drunken uncle of the violinist had to enlist the help of one of the audience to climb onto the stage clutching a bottle, obviously of alcohol. We also heard a heart-rending performance of Those Were the Days My Friend, pathos being wrung from the singer and violinst’s every note. As for the violinist, he played on and on, seemingly tireless, as a fine soloist or leader of the ensemble. The finale was a kaleidoscope of colour, the graceful balletic movements of the girls in contrast with the ever-increasing speed of the flying leaps, pirouettes and high-kicks from a squatting position of the men. It was quite breath-taking.